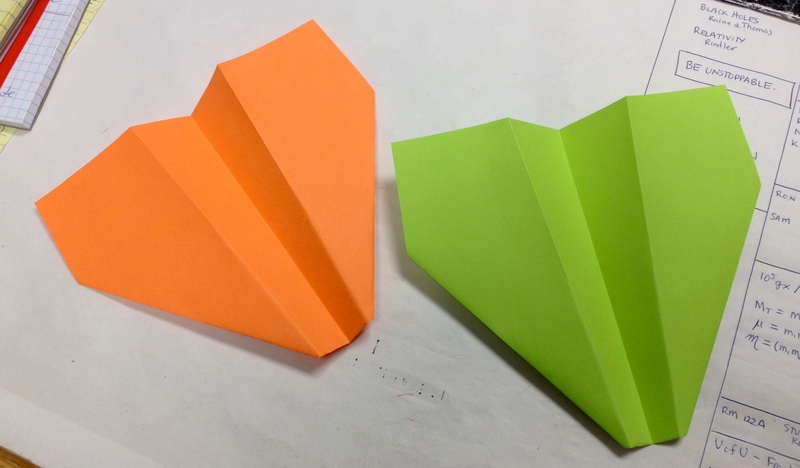 I was in the shower this morning thinking about paper airplanes, particularly the Nakamura Lock (instructions from the Exploratorium can be found here), which I have long championed as one of the finest paper planes that can easily be folded. Two Nakamura Locks I keep on my desk to entertain students, parents, University administrators, and other visitors. I discovered my love for the Nakamura Lock when I was in fifth grade, when a paper plane craze swept my school, and everyone in my class (boys and girls alike) spent several months carrying shoeboxes out to the playground filled with our best airplane designs. The Nakamura Lock is an excellent glider, staying aloft for long periods, gliding straight and true; it has won every gliding competition with my friends hands down. I discovered the wonders of the Nakamura Lock like most kids do, by trial and error. I had learned many designs from friends, taught them many of my own, then we threw them all about 10 zillion times. Each flight was a revelation. If you wanted long glides, some designs were better than others. If you wanted fancy loops or returns to you, other designs were better. You could increase the performance by changing the wing area, or changing the camber. You could correct a left-plummeting doomsday flight by making sure the wings were identical and your folds were straight and true. In the back of my head, I can hear my eighth grade science teacher, Mr. Jagdeo, speaking. “You were just using the scientific method.” We’ve all been taught the scientific method. It went something like this: (1) Make a hypothesis (2) Test and Experiment. (3) Revise Hypothesis. (4) Draw Conclusions. Now, I have very fond memories of Mr. Jagdeo; he was a formative figure in my scientific youth. But I have have no loss of love for the scientific method. It accurately captures the basic philosophy of science, but it lacks the passion and engaging mystery of how we actually do science. Every time I hear or see someone describe the scientific method I want to scream “BORING!”, gag myself with my finger and vomit. Let’s do it together — scientific method! Yes, science is a process, yes science is the best tool we have to objectively quantify Nature. But is also one of the quintessential expressions of the delight we glean in indulging our curiosity. The truth of the scientific method is that science, like solving a sudoku puzzle or or painting your own imitation Jackson Pollock, is a meandering but fun game of trying to become unconfused, punctuated by moments of inspiration and elation. When I talk to people about the scientific method, I usually use a diagram like the one below. It more accurately reflects what I think about the process, but is still a pale effigy of what I think I actually experience every day. Sometimes though, I wonder if we would keep more people interested in science if we taught them the process this way. There is no well defined procedure here; no standard forms and sections of a report that must be filled out, no bibliographies and reference citations and essays about the previous experiments and implications for the outcome of your own dalliances with science. This is much more akin to what every single one of us does every day when confronted by some conundrum in our lives. You hear a rattle when you are driving your car. You stop the car, you look under the hood, but don’t see anything obvious. Maybe it only happens when you are accelerating. You get home and have your husband stick his head under the hood while you rev the engine but to no avail; neither of you hear the rattling. You turn the air conditioning on, nothing. You turn the 8-Track player on, nothing. So you go out driving together, and decide that you only hear the rattling when you are on bumpy roads, and the sound is coming from the back seat. An investigation turns up that your 4 year old had dropped a fork (“Where did she get a fork?”) into the door panel through the slot the window rolls into. Observation… Confusion… Inspiration… Fiddling… Observation… A cycle of investigation that ultimately solves a problem, imparts new wisdom on you, or leads to new questions. That is the essence of science; that is the scientific method. And you do it every day! The reason I was thinking about this was the Nakamura Lock. I was imagining having to explain why it flies so well and it suddenly struck me that I had never asked this question before. I have flown these planes since the fifth grade, and I constantly put new designs up against it, but I had never before bothered to try and figure out why it flies so well. This too is part of the process of science — noticing something about the world around you, even if that something seems completely obvious and commonplace. Isaac Asimov, who was widely regarded as one of the finest science writers of the past fifty years, is said to have remarked “The most exciting phrase to hear in science, the one that heralds new discoveries, is not Eureka! (I found it!) but rather, ‘hmm… that’s funny…’” An eloquent statement of something every scientist would likely agree is true. Why was I suddenly struck with the question of why the Nakamura Lock flies so well? I was considering having a day in my 400 person general physics class where we built paper airplanes. You can imagine the scene of mayhem with 400 college kids throwing paper airplanes all over the place, but that is exactly what I want. People who don’t know how to fold planes would learn from someone nearby. People who do know how fold planes would teach people nearby. The whole while, everyone would be talking about how to make planes that fly, and how to make planes fly better. Then we throw them and the mayhem erupts! Some glide long distances, some fly loops, some crash gracelessly to the ground. From the mayhem of 400 experiments, we would try to understand what makes a good plane! We know that engagement, active learning, is the most successful way for people to have a memorable and rewarding experience in science. I think a day of paper airplanes in class may do the trick, and teach them some of my philosophy of the scientific method as well. Sure, it will be part of their training as young scientists and engineers; but more importantly, it will be some good life-skills training. Science, whether we know it or not, is the way we all interact with the world around us. Because like it or not, sometimes your kids have forks (or bowls of oatmeal) you didn’t even know they had, and do weird things with them (“Hey hon? Why isn’t the BluRay player working?”). PS: The reason I’ve decided the Nakamura Lock flies so well is the shape of the wings, shown below. A view of the Nakamura Lock from the rear, showing the shape of the wings and body. The inverted “V” shape captures the air under the plane. Airplanes fly because the wings provide lift. Air trapped under the wings is high pressure, while air streaming over the top of the wings is low pressure (a consequence of something called the Bernoulli effect). Just as the high pressure air in a balloon wants to get out and tries to force itself through the neck into the low pressure air, the high pressure air under the wing is trying to get to the low pressure air, but the wing is in the way so it presses up on the wing. This entry was posted in practice and tagged Exploratorium, Isaac Asimov, Jackson Pollock, Nakamura Lock, Paper plane, Philosophy of science, Scientific method, Teaching. Bookmark the permalink. Of course; please feel free — thanks for the links.